She strode on to the stage to the theme music of RUDY, an underdog understudy if ever there was one. And while at first she seemed a strange choice that only a maverick named McCain could make, Sarah Palin quickly became the running mate that every conservative could love—especially when the truths the Democratic critics tried to destroy her with only made her stronger. When Johnnie Mac (the GOP presidential candidate, not the USA's last great male tennis champion) first introduced her, I thought Governor Palin's speech about hunting game and political insiders while raising five children, including one son in Iraq, was good enough. But when news came out that not only did Sarah "keep" her Down Syndrome baby, but that she inspired her unmarried, 17-year-old pregnant daughter, Bristol, not to abort her baby as well, it showed her living the pro-life life like no speech ever could, and got the conservative Republicans to rally around her all the more. Meanwhile, the left-wing critics were left scratching their heads, slow to understand why this bombshell has backfired on them. For both souls AND polls have shown that Sarah's twice-standing-up-for-life was not only NOT a mistake, but also proved that Obama's theoretically calling it one in the case of his daughters (not to mention calling the conception issue "beyond my paygrade") was. Tonight is the night of Palin's big acceptance speech, and I have no doubt she will give a good one. Certainly the woman once dubbed "Sarah Barracuda" did not take kindly to critics who called her family "trailer trash," and if the former basketball standout who helped her high school team win a state championship on a broken leg didn't have enough incentive already to give the best vice-presidential speech in convention history, their locker room fodder certainly provided it. At Notre Dame, we fans have long been trained to pray for our team, so to us, saying an Our Father and Hail Mary for Alaska's gutsy governor at "game-time" today seems only natural. 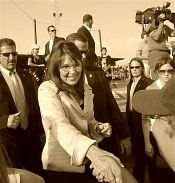 But tonight, I predict Sarah will win with a landslide of prayers, as Christian conservatives around the country adopt not only the Fighting Irish custom of real-time heavenly petition, but the new vice-presidential candidate as well, when they make the Palin family their own. The day before McCain picked Sarah Palin I told my 28 year old daughter that if it 4 years from now Sarah Palin would be the Vice Presidential pick. I didn't realize the maverick in McCain would see her great potential and go for it now. In April I had a post on our blog about her Downs Child - so I had researched her and was impressed. We have to pray for her and the Palin Family. Dear Michele -- Thanks for your comment, as well as your prophetic insight on Palin. Yes, this election is a matter of life or death, not to mention the actual flogging we Catholic bloggers could get, if the Obamination gets in.